The Mirage Alexandra offers superb luxury Alexandra Headlands family accommodation. 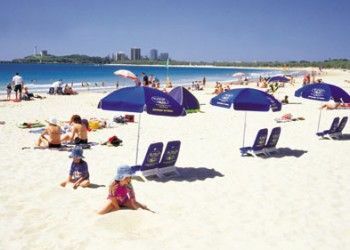 With a four and a half star rating, this Alexandra Headlands resort has all the amenities and style to make your family holiday on the Sunshine Coast a thoroughly enjoyable experience. On site, the Mirage Alexandra Headlands has a number of features to keep the kids entertained. With several pools to choose from, you can be assured that a day beside the pools will be put to good use. The main lagoon pool has gently sloping entry and is heated to a year-round temperature of at least 26 degrees. On the grassy verge at the waters-edge are a number of sun loungers for soaking in the sun, and directly behind is an outdoor dining area that sits under a sculpted sunshade. For more strenuous water babies there is a 15 metre lap pool. You’ll find our one, two and three bedroom apartments a delight too. The kitchens feature granite benchtops – are well appointed with full-sized refrigerators, dishwasher, microwave stove and oven. Our apartments also contain separate laundry facilities with washing machine and dryer – essential equipment for families staying a few nights. It’s just 150m to the Alex Surf Club and patrolled surf beach. There you’ll find a rolling beach, good if you enjoy energetic waves, and great if you enjoy surfing. The Alex Headlands has some of the best surfing on the Queensland coast. The Mirage Alex is also a great launch pad for day trips around the Sunshine Coast. For luxury family-friendly Alexandra Headlands family accommodation that is close to some of the Sunshine Coasts best-loved attractions The Mirage Alex is the obvious choice. We look forward to seeing you soon.